KoTeMoRe wrote: The IFV variant is absolutely brilliant. BRILLIANT. No. It was not accepted into service. The armored transport variant and the Boomerang program fill the respective niches better. Hope IFV version will be exported. Really has that South African look But Kamaz went long way You have to admit. I have a strong feeling that Boomerang will be long on the tooth. Article appropriately titled ''Typhoonisation''. Pictures and videos from across Russia showing really nice proliferation of Typhoon-K.
Russia has developed new 4x4 armoured vehicle K4386 Typhoon VDV for Russian airborne troops. Russian defense industry has developed the new 4x4 armoured vehicle K4386 "Typhoon-VDV" especially designed for airborne troops. According some Russian military sources, the design of the vehicle is made by the Company OJSC a subdivision of the Russian Company Kamaz. The new K4386 "Typhoon-VDV" was developed under a contract with the Russian Ministry of Defense to provide a new 4x4 armoured vehicle for Russian airborne troops. according Russian military sources, the first prototype of the vehicle is based on the K53949 which was unveiled some few years ago. October 4, 2016, the Russian Centre for Analysis of Strategies and Technologies (CAST) has released a video showing a first prototype of the K4386 "Typhoon-VDV". The Russian airborne troops expected to complete the first field trial tests at the end of 2018. According to the manufacturer, the K4386 was developed in less than 6 months and could be tested before the end of the year. The vehicle has a weight of 11 tons and can carried from six to eight military personnel. On the video released by the CAST, the K4386 seems to be fitted with a remotely operated weapon station armed with a 30mm cannon. A 7.62mm coaxial machine gun is mounted to the left side of the main armament. Three smoke grenade discharger are integrated in the armour of the turret on each side at the front of the turret. The K4386 offers a protection for the crew Level 3 STANAG 4569, against firing of small arms 7.62x51mm and mine explosion blast of 8kg under the wheels. The K4386 is motorized with a 350 horsepower Diesel engine coupled to an automatic transmission. It can run at a maximum road speed of 105 km/h with a maximum cruising range of 1,200 km. What I can tell about this is that the 30mm autocannon module on the Typhoon is more modern than the one on the Tigr. 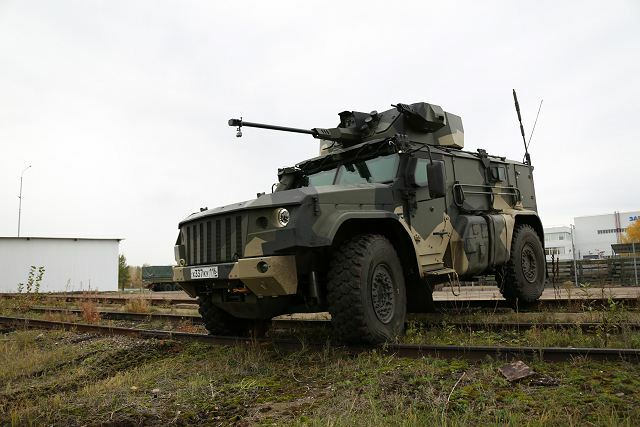 I think the Airborne Troops (and also the Naval Infantry) would find the best option in the Typhoon-K/Typhoon-U 6x6 (Kamaz 63968 and Ural 63095) that are being ordered today by the Russian Armed Forces. It is very difficult to see a 4x4 vehicle improving the performance of the 6x6 on protection of the crew. Surely the right basis for the Airborne Troops (and the Naval Infantry) would be formed by BMD-4M, BTR-MD, Typhoon-K 6x6 and Typhoon-U 6x6. All them available today. This is likely to become the standard mix of light platform vehicles, (like the Kurganets and Boomerangs will form the mix of medium platform vehicles). In overall terms the procurement of MT-LB and BTR-80(/82) (plus the SA-13 and 2S23) should stop fast in the cases still remain. Not if you need reduced dimension vehicles to airdrop. And that's the whole point. drives the wheels is torque and not HP. Give it the right transmission ratios and it can accelerate like a sports car. The vehicles of the BMD-4M platfom cover the needs of air-droppable vehicles. "POWER (the rate of doing WORK) is dependent on TORQUE and RPM. TORQUE and RPM are the MEASURED quantities of engine output. An engine produces POWER by providing a ROTATING SHAFT which can exert a given amount of TORQUE on a load at a given RPM. The amount of TORQUE the engine can exert usually varies with RPM. How much TORQUE is required to produce 300 HP at 4600 RPM? Answer: TORQUE = 300 x 5252 ÷ 4600 = 343 lb-ft. The output shaft of the gearbox of the engine in Example 4 above turns at 1591 RPM. How much TORQUE is available on that shaft? Answer: TORQUE = 300 x 5252 ÷ 1591 = 991 lb-ft.
(ignoring losses in the gearbox, of course)................."
Just to cut it short, yes i am troll and Amerikanski spy and "NATzO" fanboi. But i just cant let you claim something like this and get away with it. I am just not getting what are you taking us here for, imbeciles? Wait, KVS mentioned T-62 with faked armor in... Ukraine? Can anyone explain? Regular wrote: Wait, KVS mentioned T-64 with faked armor in... Ukraine? Can anyone explain? orientation of the ammunition which explains so many turrets being popped off in the Donbas war. Sure...have you even compared the two vehicles? Just FS&G. When I read stuff like this I'm still wondering why are you still here? These are 4.5/7 ton class vehicles with modest protection, OTT firepower and a lot of flexibility. For one BMD-4A-M you can load at least 2 K-VDV weight wise. Dimensions same stuff, 5.3m for K-VDV and ~7m for BMD-4M. The main issue will be the loss in firepower, but all the rest is virtually unchanged. Protection for VDV units is always going to be meek at best and questionable at worst. We have seen the very unsatisfactory protection of the previous series BMD's and the new variant isn't going to be a panacea. It makes sense if you want to drop these vehicles as Scout along with BMD's as backbone of VDV. It's simply more flexibility. Manned reconnaissance? Oh yes, just the future. Just amussing. 4.5/7 ton? Trying to look an "expert" but looking the contrary. Weird. The first group, in and likely in the Russian Armed Forces. The second group a little redundant. The third group likely out by problems reaching the current Russian standards. KoTeMoRe wrote: You meant t64? 12 ton 4x4 ... even the SPM-3 was 10 ton. The K-VDV is not a 12 ton machine with a Stanag 3 level. The Tigr M on heaviest variant already equivalent with 8,4 tons and horrible balance. 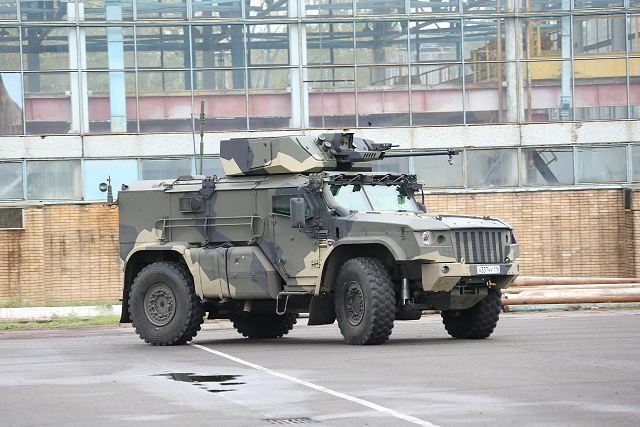 Typical GOST6 SPM-V is a 6 ton armored vehicle. It's just not funny anymore. Compare the vehicles you're talking about. 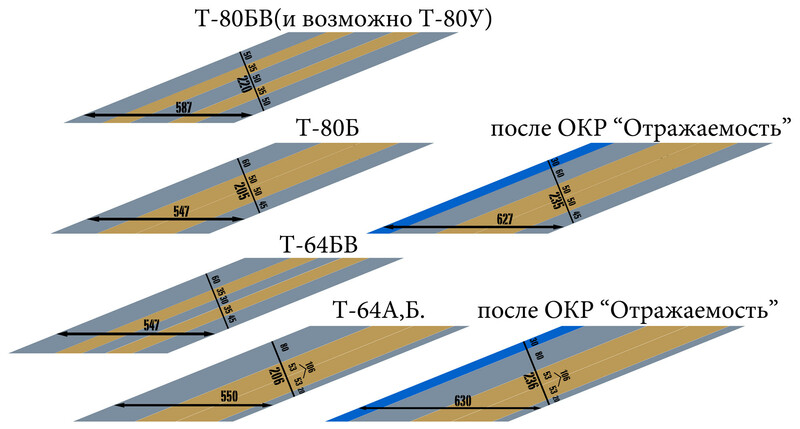 K-VDV is shorter, less armored and rearranged for VDV compared with the Taifun K allegedly at 12 tons. 4.5/7 tons... Owned... It happens because you talk before to read. See the link for the Kamaz 4386, the proposed Airborne Troops variant. It talks about the size. There even you have a picture of the vehicle with a Tigr. See the difference of size. MRAP means weight, not possible to avoid it, and 12-14 tons is being short for an effective MRAP in the current Russian standards. The problems with the tests say it. Talking about 4.5/7 tons for MRAP vehicles is a joke. It's still a 7 ton class vehicle. It's a modular MRAP with variable protection levels and a 30mm turret. Yeah it's about 20 cm higher and about 40 cm wider. MRAP doesn't mean weight by default. Just look at the OTOKAR COBRA that achieves very good survavibility without getting at 10+ tons RG-31 Nyala didn't get above 7 tons. The RG34 didn't get above 10 tons either. And these cuties were V-hull. A vehicle like the BMD-4M are not optimized at all re-IED's and Mines is general. And before you talk more smack, we saw what Houthi IED's can do to BMP-3's in Yemen. And the Protection level is almost identical. What plagued most MRAP's with MBT weight is two things, EFP's (which meant that you needed a lot more metal on the sides.) and C2. Also When you see vehicles like the RG35 in action and you know that their Stanag-3 certification puts them at 17.6 tons you wonder what exactly went wrong with all the BS +20 ton armored trucks. You have the SPM-2 that doesn't exceed 8.4 tons, with the Arbalet Turret. Short for a MRAP 12 tons? Can you please stop re quoting posts you are not replying to. There is a forum rule regarding this too. when you choose to quote another persons post please delete the parts you are not replying to so that the whole message does not get repeated over and over and your posts get longer and longer with stuff you are not actually replying to. I've got a question : What's the purpose of the barrel sleeve mounted on the BM-30 module of the Typhoon-VDV ? GarryB wrote: Can you please stop re quoting posts you are not replying to. How about actually enforcing this rule instead of just talking about it? Syrian treads have become pretty much useless, especially on the phone. Cplnew83 wrote: I've got a question : What's the purpose of the barrel sleeve mounted on the BM-30 module of the Typhoon-VDV ? 1. Small protection for gas system. 2A42 is a gas driven system (which makes sense if you want a compact gun on a rather lighter turret - see Mi 28 variants). franco wrote: New Tigr being tested including with a 30mm cannon. 30mm neat. Kinda envy Russia for it's production capabilities. I especialy love the urban combat turret mount. and generally 7.62 AP. I wonder tho if the mine blast protection is correct. It says 8kg mines wich would also suggest lvl3 protection. That would actualy be quite an achievement.